Since today is Halloween, I thought I would share an adventure photo shoot that my friends Chelsea, Evan, Jacob and I went on last Sunday. This large parcel of forested land in southern Missouri was once the home of a well-to-do family. In the early 1900s, the family built a large mansion made of stone, and there were stables, silos, fields, and walking paths through the gardens all over the estate. Sadly, most of the family died off, perhaps during an epidemic, leaving only two older sisters living on the place. They hired a groundskeeper, an albino man from the town. He ran the place well until the older ladies died, leaving the estate in the care of distant relatives who did not care to live in the old mansion. The albino groundskeeper decided to move his family onto the land and away from town. His family, also albinos, were cruelly ridiculed and mistreated in town for their different appearance, so the father hoped that moving out to this farm would offer respite and safe haven from the cruel world. However, the cruel world would not leave the albino family alone. The estate was constantly plagued with pranks from teenagers, trespassers, and every malicious encounter drove the albino groundskeeper further and further into himself and away from the hard world he had begun to hate. Two teenagers decided to go to the estate and mess around, perhaps to play pranks on the family or get into trouble. Their bodies were found on a bridge nearby, killed with a hatchet. Finally, the last straw occurred in the late 1970s when someone set fire to the old, beautiful mansion. The fire department arrived to find the old stones toppled and crumbled on top of each other, the house nothing but smoldering, smoking ruins. But there were no albino family members to be found, and no remains in the ashes. The other day I wore this outfit, my first time getting to wear a real coat this season! It's becoming pretty cold here now, so that's pretty exciting. I just keep thinking, "Baby steps to Thanksgiving break, baby steps to Thanksgiving break..."
I felt that bright red lipstick wouldn't quite go with the cloudy skies and more muted color palette of my outfit, so I ventured down the hall of my dorm to see if I could borrow a different color. My friend Emily (whom you saw in this post) recommended this purply-red amazingness. It's a lipstick from Mary Kay called "Mystic Plum", but the French translation of the name looks an awful lot like "Mysterious Prune" to me, ha! My friend Laura also gifted me with a lovely raspberry scrub, just because! How nice is that?! It was just a purply sort of day, complete with matching body scrub. If you'd like to know, I'll be doing do a write up of it and the lipstick soon to give you more details! And a P.S. : I need to resew a couple buttons on this coat, but I just haven't had time! Anybody else need a mending day as badly as I do?! I HAVE THE WINNERS FROM THE GIANT ONE YEAR ANNIVERSARY GIVEAWAY!!! I've already emailed them, so if you're a winner you should know! Well, I'll pretty much just cut to the chase here and announce them! Craft Pack - Lisa Moya! 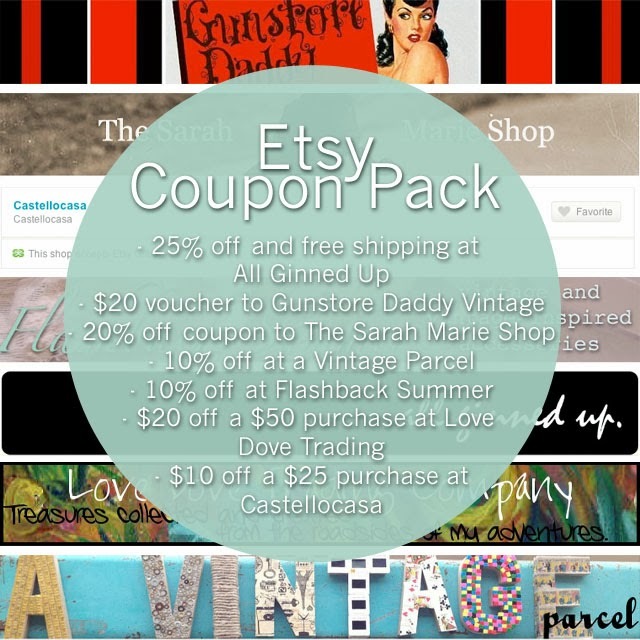 Etsy Shop Coupon Pack - Jessica Cangiano! Hospitality Pack - Emily (of Emily's Vintage Visions)! 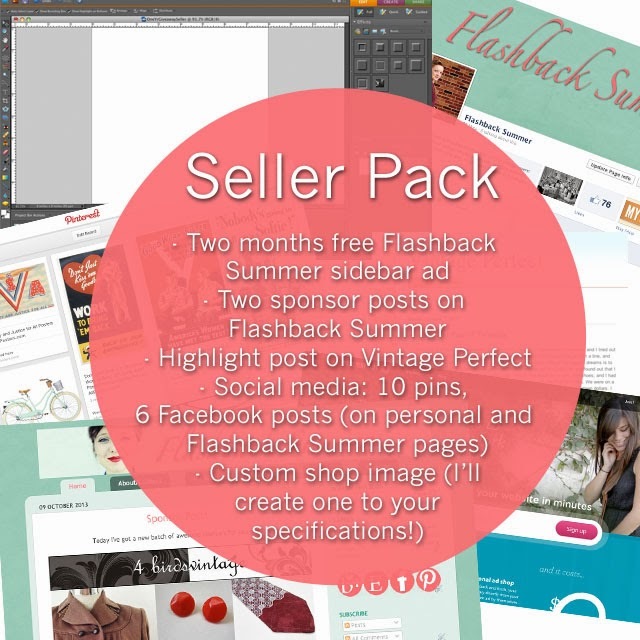 Blogger Pack - Helen Mae! Seller Pack - Anna White! Sewing Pack - Chelsea Smith! Vintage Accessories Pack - Christen Weitz! Shopping Pack - Nicole Hart! 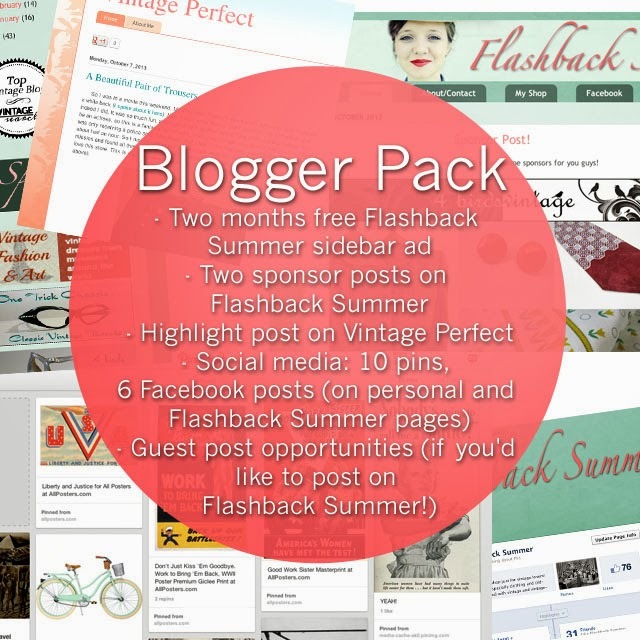 To celebrate the one year anniversary of the Flashback Summer blog, I have a giant giveaway for all you readers to say thank you for all of your support on my blogger journey. This first year has involved new friendships, new discoveries, and a whole lot of learning, and I so appreciate all of you! 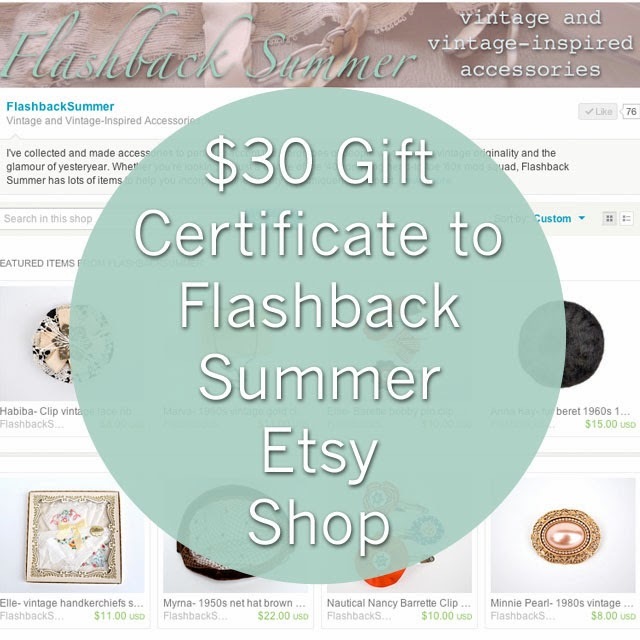 - Some things, like being subscribed to Flashback Summer, can only be done once but will give you an entry for every prize pack. Go ahead and use that to your advantage! It's perfectly fine to only subscribe/follow the blog once and use that to gain an entry in every prize pack. 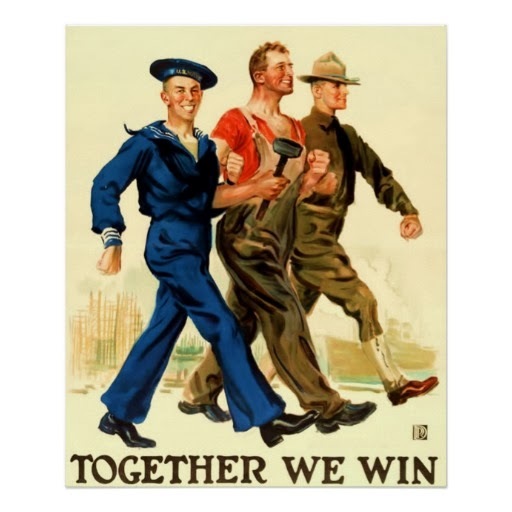 - Other things, like pinning to Pinterest, must be different for every entry. - Pinning can be done every day of the giveaway for more entries, as long as it's a different pin every time! 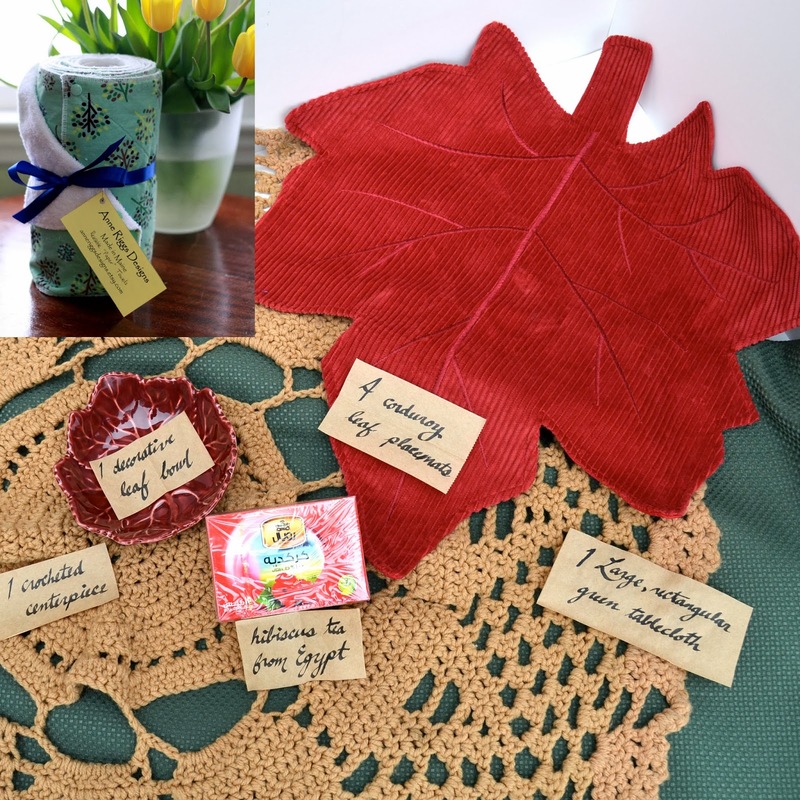 - Prizes with physical items are open only to North America residents, but other prizes (like blogger pack and Etsy shop coupons) are open to everyone! The giveaway ends 25 October at 12 am Central (US) time! If you need any help or clarification, please feel free to leave a comment or email me! Look! It has little mosques and buildings and turbaned men and a little market scene!!! While I'm not usually into the poufiness of 1950s styles, who can resist a swishy crinoline now and then? This skirt is quite full, so I borrowed another crinoline from my friend Hannah and stacked them for extra pouf. While I don't think I'll be wearing this style all the time, it most definitely has a New Look/ princess/ glam feel about it! In fact, I'm more motivated to consider these fuller skirt/dress styles more often and to look into getting a proper crinoline! Also, I realized just now that this skirt print is actually a color variation from another Middle East novelty print skirt I originally posted about. (I like my color combo better!) How crazy is that, huh?! Doesn't Aria have a cool style? I sure think she does. This is me reenacting the face a girl gave me as she walked by, no exaggeration. And that, of course, is Aria.